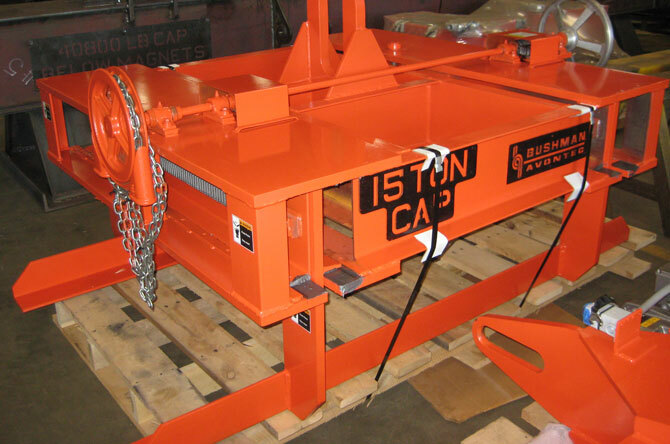 Bushman Equipment, Inc. manufactures a complete line of sheet lifting, plate lifting and bundle lifting equipment engineered to meet a variety of dimensional, capacity and application requirements. 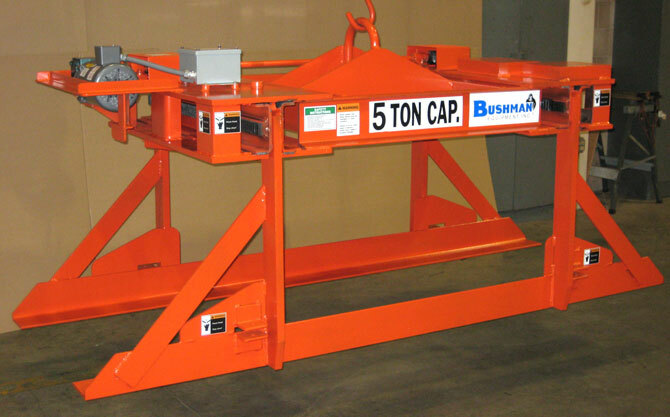 Bushman Equipment, Inc. below-the-hook Sheet Lifters have many production applications and numerous optional features to customize the equipment to your individual needs. 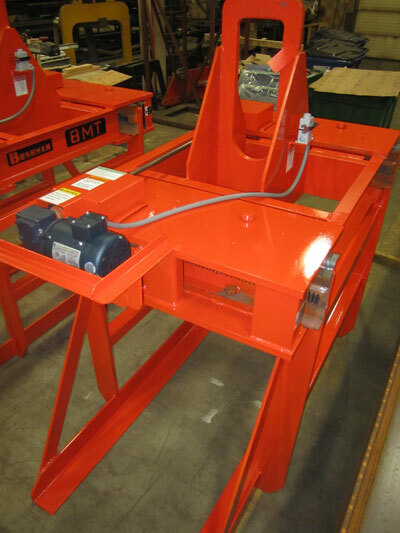 Every Bushman sheet lifter, plate lifter or bundle lifter is made-to-order. You get it, “your way”. Our engineering staff will work with your design requirements to improve the efficiency, safety and quality of your material handling functions. All sheet lifters are designed according to the latest revisions of ASME Specifications B30.20 and BTH-1, Design of Below-the-Hook Lifting Devices. Sheet lifters are normally used to lift and move single or multiple stacks of cut-to-length sheets of steel or aluminum. 10 ton sheet lifter with carrying angles that are operated by a hand wheel. The design of a sheet lifter depends on a number of important factors that are illustrated below. How are the sheets lifted? 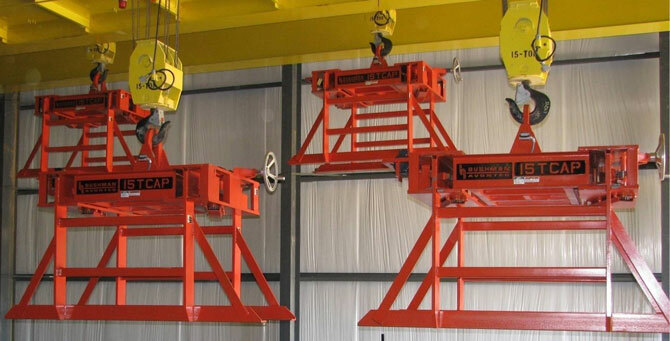 Answering these questions will help to define the basic design of the sheet lifter. Left: Light Duty 5 ton capacity with hand chain wheel lifts 1-2 small bundles. Right: Heavy Duty 7 ½ ton capacity electric, lifts multiple bundles regularly. Structural steel carrying angles are most often used for lifting banded stacks with or without pallets. It is desirable for the longest load to overhang the ends of the carrying angles by one to two feet. If extra long loads must occasionally be lifted, pin-on extension angles may be used. Loads of varying lengths or loads being lifted off of a conveyor will need individual lifting forks placed at fixed positions. Sheet stacks of varying pallet lengths and lifted by the fork pockets often require adjustable sliding forks. 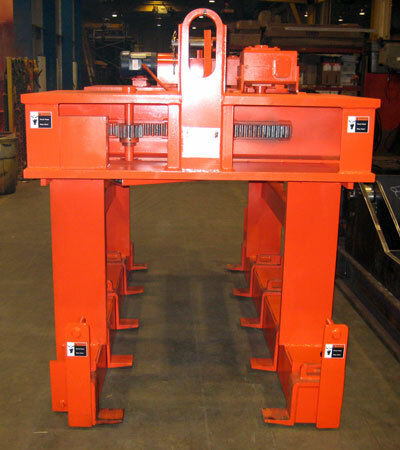 Adjustable forks can be added, removed, or positioned to accommodate any pallet configuration. For handling short to very long loads on a regular basis, here is a hydraulic sheet lifter with telescoping arms and removable, adjustable forks. Stacks of over 40 ft. long can be safely handled. 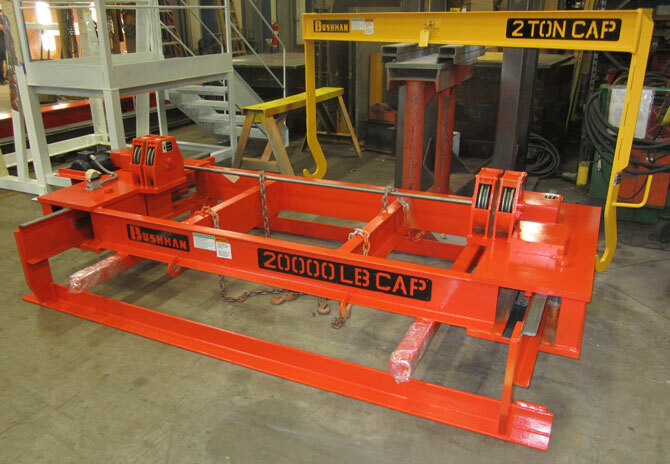 When scheduled high volume product runs of specific lengths are required, this sheet lifter is outfitted with three (3) sets of interchangeable carrying arms. Sheet lifters can be powered by several means, from a simple hand wheel to a severe duty electric-hydraulic system. Left: Standard end-mounted hand wheel operation. Right: Side-mounted hand wheel (avoids standing on sheet stack). Hand chain wheels are used for high stacking. The operator can remain on the floor when releasing the sheet lifter from a stacked load. In picture above this unit has a hand wheel (while at floor level) and a chain wheel (when stacking). Electric motor-driven sheet lifters are used in higher duty cycle applications or on large units with heavy carrying angles. A power cable must be brought to the lifter from the crane. For low duty applications where the crane has no power cable to plug into the lifter, a self-contained battery powered sheet lifter is offered. It is equipped with two heavy duty marine batteries, motor controller and push button pendant. A battery charger is also included for keeping the batteries charged when the lifter is not being used. 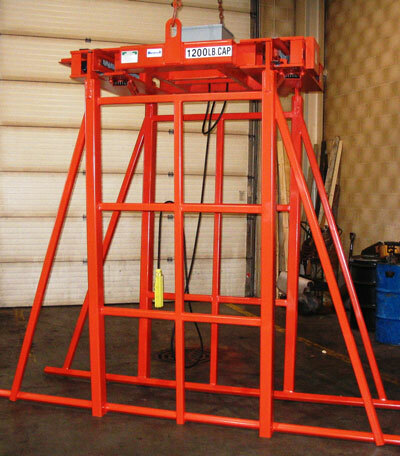 For the most severe duty applications, especially where it is necessary to lift multiple sheet stacks, an electric-hydraulic sheet lifter is recommended. These lifters are powered by four (4) hydraulic cylinders, supplied by a self-contained on-board power unit with motor, pump, valves and fluid reservoir. Oftentimes the sheet lifter is an integral part of the crane, meaning that its motor controls and operator buttons are part of the crane control system. If separate controls are needed, Bushman will supply the operator interface that you desire. Left: A hard-wired push button pendant station is attached to the lifter; either with a length of cable, or in this picture, attached to an operator console. Right: A self-contained radio remote control system can be used so that the operator does not need to be “attached” to the lifter while operating it. Does your crane have a single hook? Twin hooks from a single hoist? Multiple trolleys? These factors are considered during the design of your sheet lifter. Left: A single steel bail plate is most common. The bail opening is designed specifically for the crane it will be used with. Right: This lifter has three (3) pin style lifting bails. The center pin is for use on a single hook crane. The two outer bails are for use on a twin-hook crane. These cranes have double trolleys. Each trolley can attach its hook to a sheet lifter. The two lifters can be ganged together to lift very long sheets/plates. This lifter will be directly reeved in to the crane, with its only task being to operate as a “sheet lifting” crane. Bushman offers special features and designs for truly unique lifting applications. Left: Extra long carrying arms with fixed-position forks. Right: Bolt-on aluminum “fingers” for handling delicate pieces. Left: End hooks (with blue chain) can be used to secure the ends of highly flexible light gage sheets. 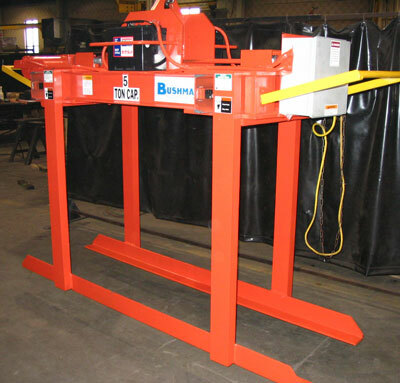 Right: This sheet lifter has separately powered end support arms. This 60,000 pound sheet lifter handles pin pallets loaded with steel blanks headed to a truck assembly plant. The entire lifter has motorized 270° rotation. 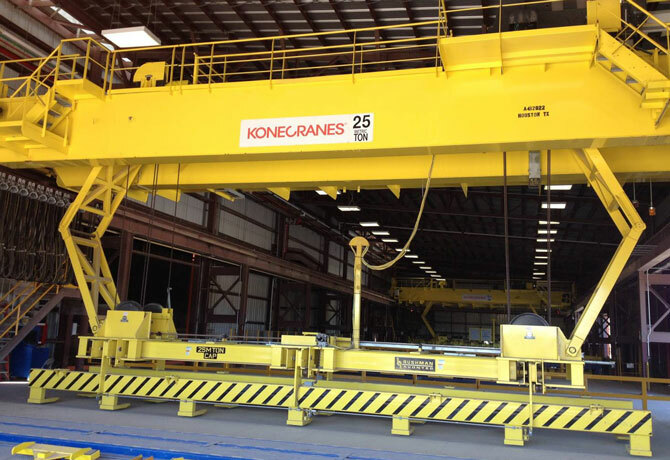 Bushman Equipment designed this sheet lifter and crane system for a steel and aluminum blanking company. This customer added plastic wrapping as a new value-added service. 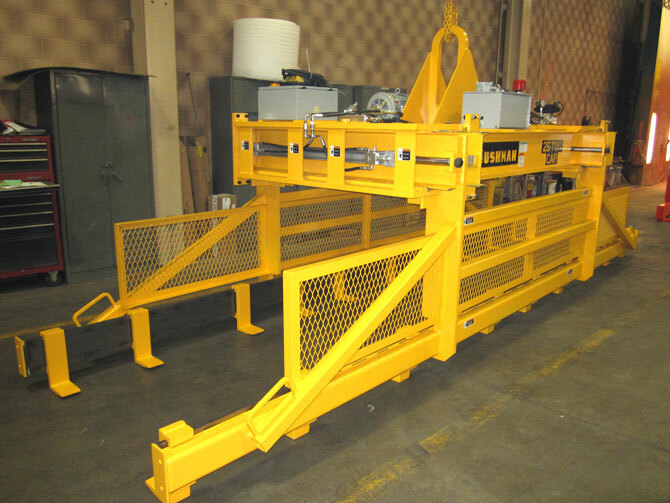 Bushman’s heavy duty, motorized sheet lifter picks up 30,000 pound plastic wrapped stacks from a conveyor and puts them on a shipping pallet. 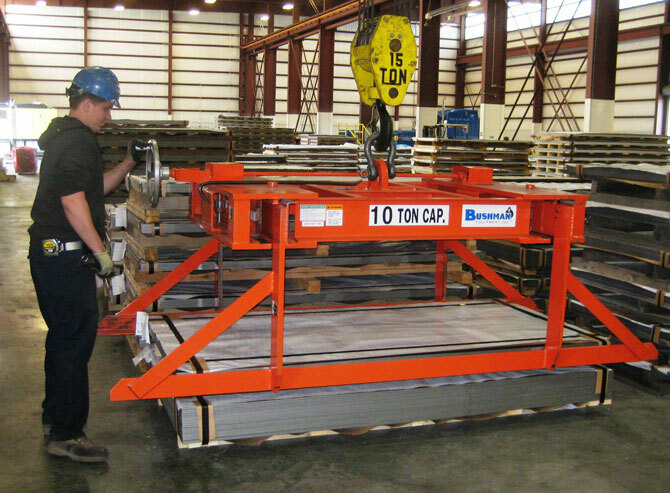 This single lifter can safely pick up a wide range of sheet lengths and widths. The lifter has 14 lifting forks on each side, spaced to clear the conveyor rollers, helping to reduce the potential for product damage.